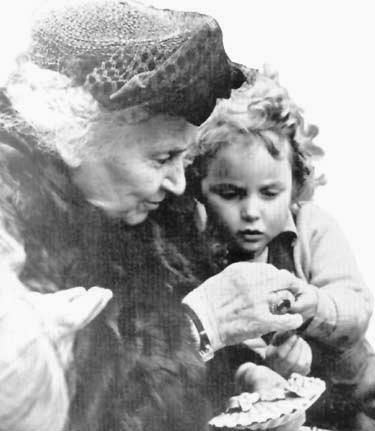 Dr. Maria Montessori was born in Italy on August 31, 1870. She was born to a well-respected family and was expected to grow up to fulfill the traditional role for the Italian woman. Instead, she pursued an advanced degree at the University of Rome and became the first woman physician. Her interests drew her to work with children, initially those who were disadvantaged and had special needs. Because of her training as an anthropologist, Montessori’s decisions about working with children were made by observing them first. She was not trained as an educator and thus her decisions were based upon watching what children did and what they were attracted to. Through her observations and trial and error, she developed what became known as the Montessori Method of Education. It was a radical departure in Montessori’s own time. She did not place children in restricting environments but instead designed the environment to reflect the children. Tables and chairs were child-sized and materials were placed on low shelves to be readily accessible to the students. In addition, many of the activities were designed to teach children how to become more independent and to do things for themselves. Montessori continued throughout her life to work for the betterment of the lives of children, founding training centers for teachers and dispersing this method of education throughout the world. During her later years, her focus became centered on educating children to promote the principles of peace. Her legacy has been the establishment of Montessori schools around the world, which promote the cause of the child as a citizen of the world.